"Free as Flower" Every girl wants to blossom and be free as a flower. Today's outfit is about being free, fun yet elegant. 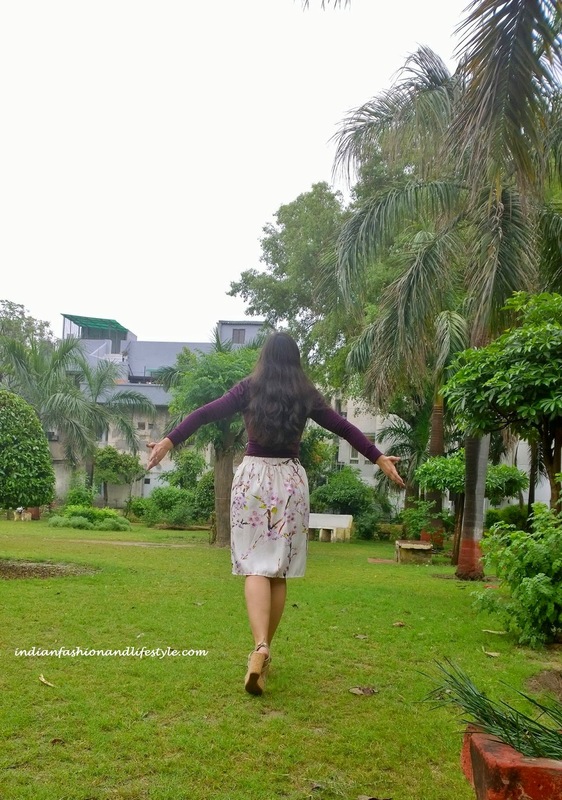 It was raining in morning, here in Delhi and I had promised my friend brunch at her terrace garden. 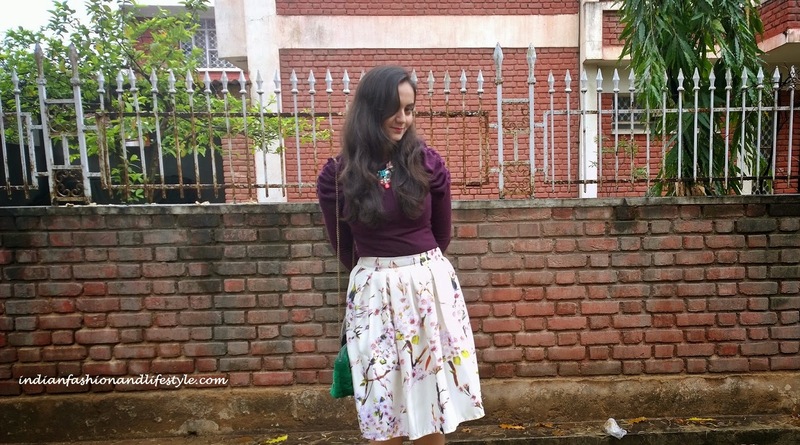 So, for the brunch I decided to wear a floral midi skirt which I got from choies.com some time back. 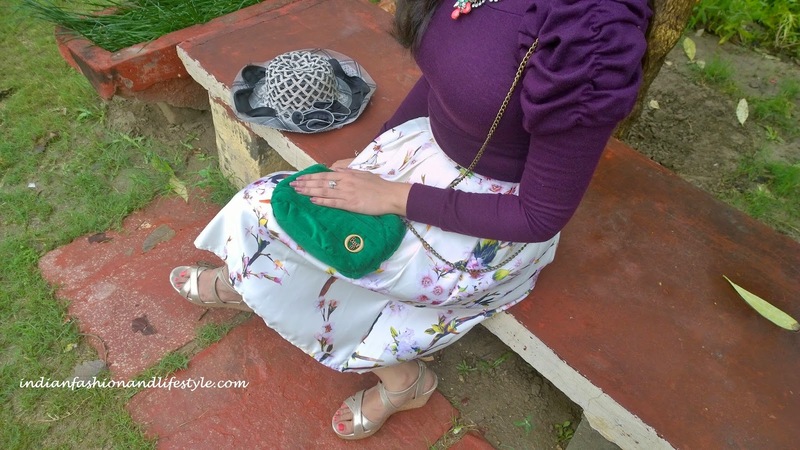 I have styled the outfit with a purple puff full sleeves top which is body hugging. I have paired it will golden color wedges and a pretty neck-piece from choies.com. 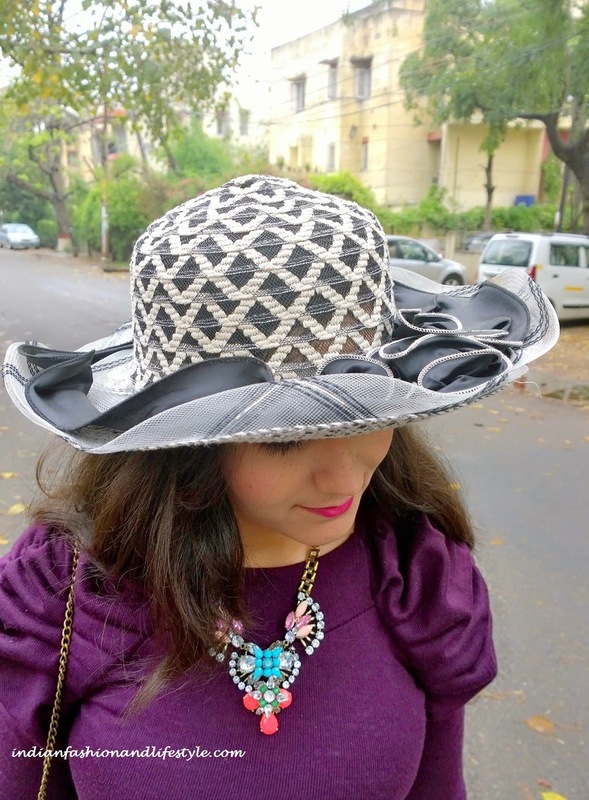 To complete the look I have teamed up with Baggit sling bag(talked about it here). I believe in dressing elegant for brunch, but this time weather was so good that fun element was required. Instead of straight hairs I have wavy hairs with side part. 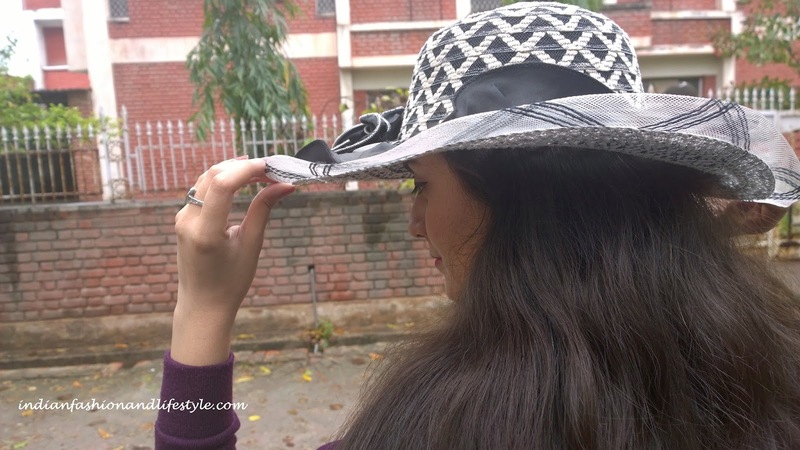 For brunch in a garden, I took hat with me which I bought from Nainital, because Sun after rainy morning is just unavoidable. I have used LA Splash pink colored matte lipstick which I got in FAB bag here. Where are you stuck? on Pink lips or neck piece? When you plan not to carry many things in your bag then sling bags are the best options. The green sling bag from baggit has enough space to carry my stuff and complements the outfit. You like my shoes? The wedges are an absolute comfort. Since the day I received the shoes I am going crazy on them. This pretty pair goes with many dresses. Because they are wedges they not only give height but also are very comfortable. I wore them for 8 hours when I attended Amazon Fashion Week. Blue Button has launched some amazing pieces for spring summer collection you can check them out. I thank Mayank for helping me out with pictures. Do you like the look? Tell us in comments below. Feeling the cold breeze and simply loving the weather. It time to go for brunch with friends. Will catch up soon with more looks. Till then stay fashionably young. Love your hat so much. Its so cute and Weather looks amazing. I very like midi skirt like your! Really beautiful on your outfit, Love the skirt! I love your skirt, really lovely. Great style and color match! Oh darling, your skirt is very nice! Pretty look, Manasi. I love the hat and skirt. Terrific spring outfit. Great outfit, love your top. cute floreal look!!! I really love the skirt:) You're beautiful! Beautiful look! That skirt is perfect for spring. You look beautiful. And I just love that handbag as well. Such an amazing skirt! Love it ! I love this skirt! Floral print is perfect for the spring! Great style! Very chic look, the skirt is so beautiful. That looks totally fabulous! Really love it! absolutely in love with the skirt!! Everything looks PERFECT with this outfit. Check out the latest giveaway and thanks for sharing.